Tom Hardy Confirms Carnage Is the Villain in Venom? Did Tom Hardy just accidentally confirm that Carnage is going to be in the Venom movie? At this point, it would probably be nothing shy of disappointing if the fan-favorite bad guy didn't appear in Venom, given how much conversation has swirled surrounding his possible inclusion in the upcoming Spider-Man spin-off (that may or may not actually feature Tom Holland's Peter Parker in some capacity). Now, thanks to star Tom Hardy, it looks like we more or less have the confirmation we've been looking for. Plot details for Venom have largely been kept under wraps by Sony at this point, but Carnage has been rumored to be the movie's main villain pretty much since the beginning. With that in mind, Tom Hardy's since-deleted recent Instagram post is more than intriguing. The image features Tom Hardy as Eddie Brock in the foreground, with Carnage looming terrifyingly large in the background. Then he mysteriously had to delete it. Why post something like that and then delete it? Well, likely because Sony didn't want to spoil the Carnage reveal in this way. In any case, if Carnage is in the movie, it's a pretty poorly kept secret at this point. No matter what, the cat is pretty much out of the bag. In case you aren't overly familiar, Carnage is a villain who starts life as a bad guy with no powers of any kind named Cletus Kasady. He is a straight-up serial killer who is as evil as they come. The guy killed his own grandmother and also killed more than a dozen people before winding up in jail and sharing a cell with Eddie Brock. As for how he ultimately becomes Carnage? At one point, the Venom symbiote visits Brock and allows him to bust out of jail. However, offspring of the symbiote was left behind and bonded with Cletus. Thus, we get Carnage. The Venom symbiote accents the more extreme personality traits one carries. So for Cletus, that means his evil is amplified in a big, ugly way. 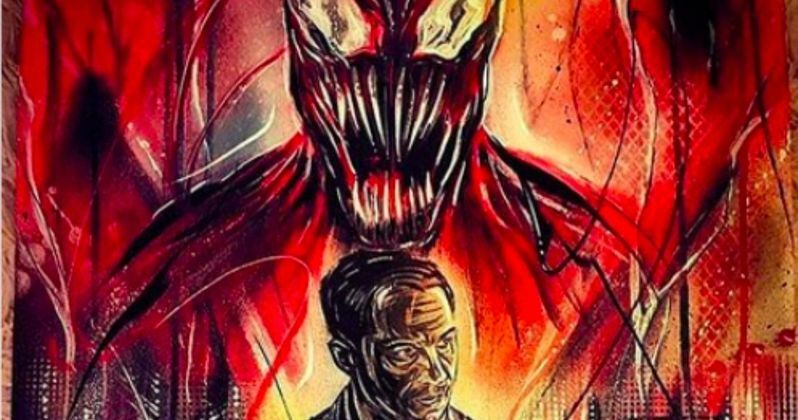 Originally, it was suspected that Riz Ahmed (Rogue One) was going to be playing Carnage, but that has since pretty much been squashed, unless the movie winds up taking some very serious liberties with the source material. In addition to Ahmed, the movie also stars Michelle Williams (Manchester by the Sea), Jenny Slate (Gifted) and it was recently reported that Woody Harrelson is in talks to join the movie. That hasn't been confirmed, but he would make an excellent Cletus Cassidy. Ruben Fleischer (Zombieland) is directing Venom, which is set to arrive in theaters on October 5. This is the first of Sony's planned Spider-Man spin-off movies, which will also include Silver and Black and a Morbius the Living Vampire movie, among other yet-to-be-revealed projects. In the meantime, you can check out Tom Hardy's deleted Instagram post, courtesy Mclovin Gaylord's Twitter account, for yourself below.